Hey, all you skatepunks and facebookers and under-30 neo-hippies: you know that word “Rambo” that you toss around to describe tough guys? It’s an unquestioned part of modern worldwide vernacular: you use it as sarcasm, insult or deflective compliment; newscasters use it to sprinkle their reports with humor; sociologists use it to identify unnecessary brutality; the word is in the Oxford English Dictionary, fer chrissakes! Rambo. This is where that word came from – FIRST BLOOD. It didn’t originate with any of those misnamed sequels sporting the “Rambo” dog tag. It originated in a novel by David Morrell (First Blood, 1972), subsequently made into this effective, primal, unlikely hit. FIRST BLOOD would not only augment Sylvester Stallone’s existing toughguy career (by this film’s release, he was already up to ROCKY III), it was a tectonic cultural groundslam, spawning the sequels that would bear the “Rambo” moniker and entrench the archetype in world consciousness. “Rambo” virtually wiped out the other metaphors for tough guys: Hercules, Samson and Tarzan. Viet Nam is over. A bedraggled ex-Special Forces operative, John Rambo, (Stallone) tramps into a hick American town, searching for long-dead friends and a hot meal. 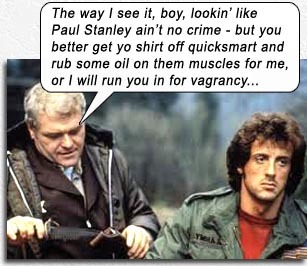 The antagonistic sheriff, Will Teasle (Brian Dennehy) wants Rambo to keep walkin.’ When Rambo refuses, Teasle (that name just kills me!) hauls him to jail, where all the smalltown redneck officers (including Bill McKinney and David Caruso) beat, berate and bully the compliant Rambo to his breaking point. And then all Italian Stallion breaks loose. It is established that Rambo is a “war hero” (whatever that means – maybe that he has big muscles) and the movie is a slight nod to post-war trauma and the difficulty in assimilating back into society – especially redneck Amuuurican society that is the least likely to accept you, that you are most apt to have come from. But that theme will only surface towards the end, when Rambo gives his Grand Soliloquy. For the most part, FIRST BLOOD is an adrenalin punch in the face, appealing to our primal revenge instincts. Escaping the police station, Rambo flees into the forest, Teasle on his tail (I kill me!) and the whole sheriff’s department as posse. Like a baleful wolf blending into the forest, Rambo stalks the namby-pamby officers, putting them out of commission one by one. And as surprising as it may sound, Rambo actually “kills” no one! Though this movie has a violent reputation (garnered in retrospect by its sequels), in FIRST BLOOD, only one officer falls from a helicopter and dies accidentally. Body count: 1! This sends Teasle into a tizzy (I’m dyin’ over here!) – even though he was the one who started the conflict by provoking Rambo. The story ignites our sense of perverted Justice very well indeed. We’re on Rambo’s side from minute one. I’m sure David Morell did not intend to rip off CHATO’S LAND (1972) – Bronson’s Apache picking off his white pursuers one by one – but that is the brutal template FIRST BLOOD is fashioned on. The hunters becoming the hunted. After Rambo puts his infamous gigantic hunting knife to Teasle’s throat and warns, “Don’t push it…or I’ll give you a war you won’t believe!” – the military are called in. Hoo-rah! With them comes Colonel Trautman (Richard Crenna), who was Rambo’s trainer, therefore someone who can presumably hit Rambo’s PAUSE button. Unfortunately, Trautman can only talk in clichés and dynamic one-liners that involve doing a camera-turn before he exits the room; he overacts so much that five extras got their SAG cards just by standing near him. Writers: David Morrell, Michael Kozoll, William Sackheim, Sylvester Stallone. Starring: Sylvester Stallone, Richard Crenna, Brian Dennehy, Bill McKinney, David Caruso, Jack Starrett, Michael Talbott, Chris Mulkey, John McLiam, Alf Humphreys.